Another photo from the archives. This is from last month. I learned that the lowest tides of the year – more than three feet below normal low tide! – was due to fall around noon on a weekend! That was too good a combination to pass up. I made impromptu plans to bring Alex to the beach while Patrick napped. To Alex, a minus tide means nothing. 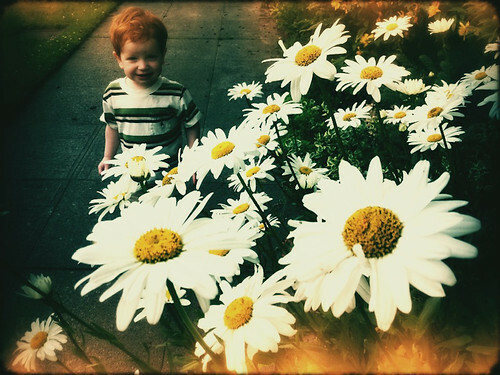 I took him to Carkeek Park. I hadn’t been there in probably seven years. It didn’t have the rocky beaches I was looking for, but it didn’t matter. Alex was tired, cranky, and no amount of pleading could convince Alex to get anywhere near the waterline. We played on the beach for ten minutes and he was ready to go home. 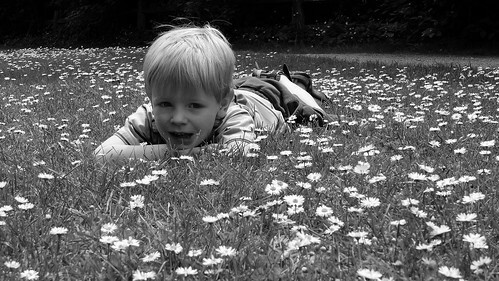 The only good thing from this trip: On the way back to the car, I somehow talked Alex into lying down in a field of flowers long enough for me to take this picture. I love it. …that they could have much better parents than they currently have. Just one of the many superior sets of parents they could choose: Our friends, the Brushes. 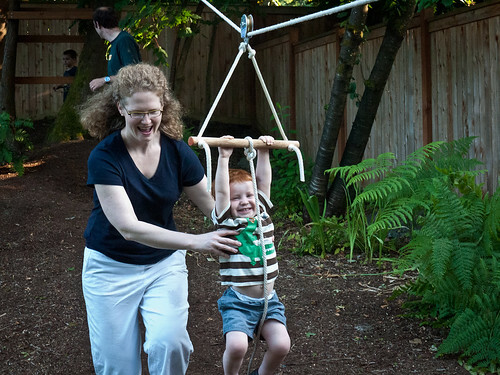 We took our kids to the almost-monthly dinner club on Sunday, which A.J. and Mike Brush hosted. In the back yard, they had a tree house. 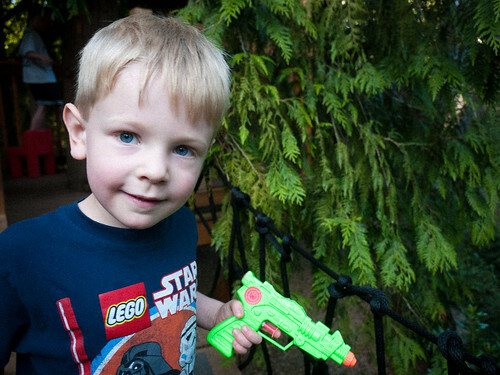 Here’s Alex, using a squirt gun to guard the bridge that leads to the tree house. No grown ups allowed! As if a cool tree house (complete with a spiral slide down to the ground!) 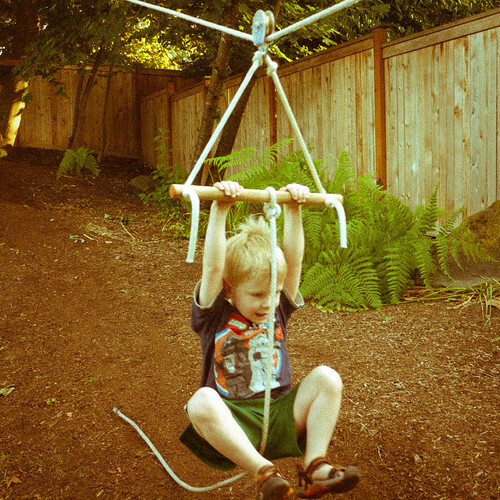 wasn’t enough to seal our inferiority as parents… they have a zipline, too. Both of our kids went for a ride. Yup, this is pretty much a slice of Little Boy Heaven right here in Bellevue. For some reason, the kids decided to come home with us that night…! Want To See How Strong I Am? Want To See How Strong I Am?, originally uploaded by B.K. Dewey. 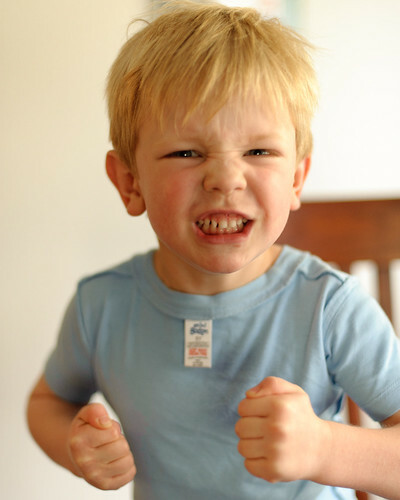 Alex sometimes asks, “Do you want to see how strong I am?” If you answer “yes,” he busts out this fearsome move. He’s like a blond Incredible Hulk. Today, Patrick moved to the next room at daycare. He’s with the same teachers that Alex had when he was two. This is really strange. I remember Alex in this room, and I remember how he seemed like a big kid. I also remember thinking, I can’t wait until Patrick is this old… Well, that time has come. To mark the occasion, here are some Patrick observations. In spite of the above: He refuses to let me read him bedtime stories. It must be mama. He’s in a hoarding phase. He’ll pick up something small and carry it around all day. The current obsession is a pair of Playmobil fish. Favorite food: Cheese pizza. Luckily for us, Alex has also developed a taste for cheese pizza – this is a recent development. It means we now have a exhausted-end-of-week dinner option that the whole family will eat. Patrick will also eat anything that comes from Mommy or Daddy’s plate. The same food, on his own plate, is unappetizing. Similarly, he wants to do whatever his older brother is doing. The same activity, on his own, would be boring. We’ve let Patrick watch some of The Jungle Book. “Watch movie” and “Jungle Book” are now two of his clearest phrases. His favorite part is the elephant march. His stubbornness shows no signs of going away!